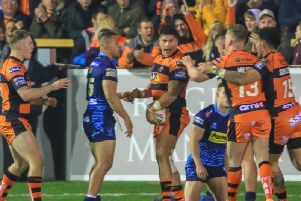 Peter Mata'utia, who could be set for a half-back role for Castleford Tigers against Wigan Warriors after switching to this position in the second half against Leeds Rhinos. 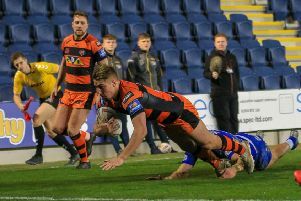 Daryl Powell has backed his Castleford Tigers team to cope with a shortage of half-backs for their game against Wigan Warriors tonight. The Tigers go into the home match with the 2018 Grand Final winners without the long term injured duo Luke Gale and Jamie Ellis plus off season signing Jordan Rankin, who sustained a hamstring injury last week. They have also recently parted company with another half-back in Ben Roberts and have Paul McShane - who started at scrum-half at Leeds Rhinos last week - suspended. Cas boss Powell admitted it has given his team some problems to solve ahead of the Wigan game, but he expects to only have to make short term measures with Rankin possibly back in action next week. He said: "It's very hard when you've got three blokes injured at half-back. They're big signings are half-backs and we've just got to come up with a way of playing that will do a job. "I thought we were pretty good in the second half last week, but if you lose a half-back in your team run it makes life difficult for you and that's what happened to us last week. "We need to play a slightly different way. How we shaped up last week was pretty successful for us. We had a pretty good second half so we will shape up with something similar. "Jake Trueman will play a pivotal role and it is what it is. We have got injuries, we just have to get on with. "Jordan Rankin should be fit again in the next week or so, so that will help." Powell, meanwhile, admitted that the Tigers were looking to bring in an outside back. He added: "We're still in the early to mid process. We've got a couple of irons in the fire, but we have nothing to name at the moment. "We're just having a look around at outside backs. "We've got some good outside backs, but form's not been great with a couple of them and we need to look at our options moving forward."